Love these festive Rifle Paper Co. cards to send out to friends and family during the Halloween season. I also think they could be cute framed and paired up with the cute witch silhouette picture from Social Manor. The Halloween Hair Ties are from my new hair tie collection and I think they are a perfect hostess, friend or family gift - small something to spread Halloween fun. Every Halloween party needs some kind of potion and these bottles from Big Lots would be a perfect way to serve the "potions." On the pumpkins, I love mixing the harder jute material with the sparkle - adds texture and character. Last, but definitely not least, your candy bowl. One of the most important pieces of Halloween decor. 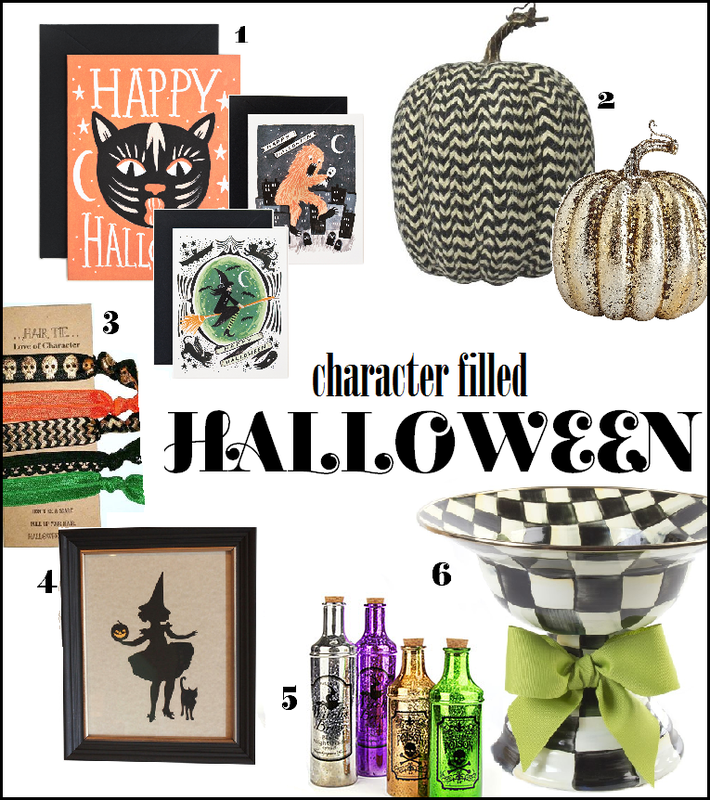 I love the black and white MacKenzie Child's pattern for Halloween. It's a costly candy bowl, but you can leave it out all year long! Also, make sure you are checking out your local Target Dollar Spot and Dollar Tree stores if you need affordable or mass quantity decorations. I share another night all the goodies I've purchased! LOVE the spread, darling!!! Thanks for the tag Mary! Sharing today!